Andrea Beaty has written picture books about children with passions that when fostered lead to careers in science, architecture and engineering. 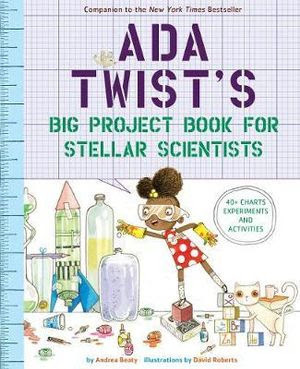 Now Beaty and David Roberts have created an activity book based on the picture book Ada Twist Scientist, to foster a curious child's exploration of STEM (Science, Technology, Engineering and Mathematics) related occupations. Ada Twist's Big Project Book for Stellar Scientist is packed with 40 plus things to discover, draw and make. Within the book there are places for children to write and draw, making it a special and personalised project book. This activity book will help the inquiring mind learn how scientists ask the questions; what, why, how and when. It guides readers to use scientific methods to question, research, collect data and test information. Some activities can be completed in an afternoon, like making an aquascope or observing a chemical reaction between vinegar and baking soda. While other activities show children that scientists need patience as they; track the phases of the moon, record weather changes and grow plants. Each of the projects in Ada Twist's Big Project Book for Stellar Scientist introduce different scientific fields. The activities unpack information about physical and biological sciences for primary school aged children. A glossary is included to assist in understanding the scientific language that is used through out the book. If you haven't read Ada Twist Scientist don't fear because the story's text is included in the book with a few of Roberts' illustrations. Other books in this series to read are Rosie Revere, Engineer and Iggy Peck, Architect and keep an eye out for their project books too.